Have you ever experienced a strange sleep episode that left you in a state of confusion? Believe it or not, but there is a scientific explanation behind these weird sleep phenomena. We have listed below the top 8 most commonly experienced strange sleep encounters and its causes! 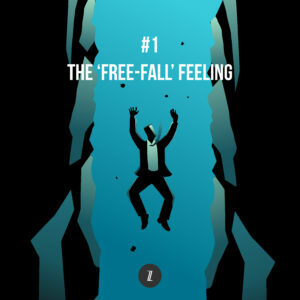 If you’ve ever been jolted awake by the physical sensation of falling just as you were about to drift off to sleep, do not fret – there is an explanation for this. Scientifically, this sleep phenomenon is known as hypnagogic (or hypnic) jerks, defined as an involuntary twitch that occurs just as you are about to fall asleep. Though there are various reasons for hypnic jerks such as high stress or anxiety levels, a widely accepted reason is the brain misunderstanding what the bodily muscles are experiencing. When your muscles relax as you lay down to sleep, the brain might misinterpret the muscle relaxing as a result of your body actually falling, hence firing signals to your muscles to tense up – resulting in the hypnic jerk. One of the most harrowing sleep encounters, sleep paralysis is defined as the inability to move or speak immediately after waking up. If you’ve experienced this and attributed it to supernatural beliefs, you can heave a sigh of relief for sleep paralysis is caused by waking up before the rapid eye movement (REM) sleep is completed. REM sleep is a specific stage in the sleep cycle which involves extremely deep sleep. Occasionally, the brain has graphic dreams during REM sleep, while bodily muscles are still resting. Sleep paralysis often happens when one wakes up before the REM sleep stage is completed, with a conscious brain but an immobilized body given that the body is still ‘asleep’. It takes a while for the brain to send signals to the body to respond. Hence, in such instances, it is wise to stay calm and wait for your body to gain back its strength. 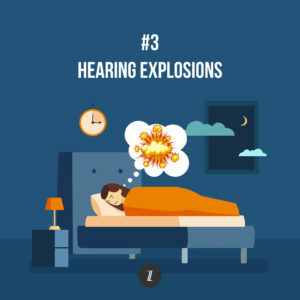 Also known as Exploding Head Syndrome (EHS), some of us might have heard a sudden explosion just as you were about to sleep or even during your sleep. A plausible explanation for this phenomenon is due to the brain facing difficulties shutting down for sleep. Research has found that the brain undergoes a series of steps before shutting down for complete rest as you drift off to sleep. Normally, auditory and visual neurons are inhibited in this process. However, in some cases, these auditory and visual neurons might fire off all at once, creating a perception of sound which is what happens during EHS. Although there has been no major breakthrough on the research done on recurring dreams , there has been various psychological attempts at explaining why some people experience this. Recurring dreams often mean that there is an unsolved problem in your life that you are not acknowledging or attempting to solve, resulting in stress. This alternate theory suggests that when recurring dreams lessen with time, it means that the conflict in your life is successfully being resolved. Have you ever witness someone fall asleep and witnessed their fingers twitch vigorously? Small bodily twitches are known as sleep twitches, and are commonly witnessed in a sleeping person’s eyes, lips, fingers and feet. When a person is sleeping, there might be instances in deep dreams that the body will involuntarily want to respond to – such as running away from a dinosaur in your dream. However, the hormone which governs larger muscles, serotonin, is not produced by the body during sleep. As such, smaller muscles such as the feet create small motions which does not risk waking or injuring the body, leading to what looks like a small twitch in the feet. If you’ve ever been told you sleep talk, it is time you take a day in to unwind and relax. 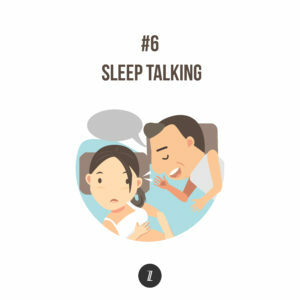 Formerly known as somniloquy, sleep talking is defined as a sleep disorder that involves talking during sleep without being aware of it. Sleep talking can involve monologues or complicated dialogues, mumbling or even complete gibberish. A common cause for sleep talking is stress, sleep-deprivation and daytime drowsiness, though it is also found to be related to sleep apnea and depression. However, it is easily cured with a proper sleep schedule, mindful meditation and ample time to de-stress! A sign that you might be suffering from hypnogogic hallucinations is imagining very realistic objects or events before falling asleep, or during sleep. These imaginations can be perceived through any of the five senses (sight, smell, taste, touch, hearing), and might cause you to wake up in extreme fear or thinking that your hallucinations were real. 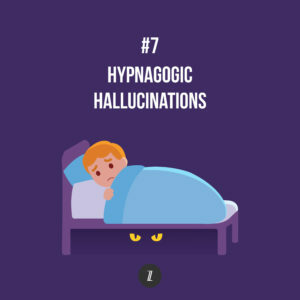 Though the exact causes of hypnagogic hallucinations have not been discovered, multiple studies have found an apparent causal relationship between insomnia, anxiety, stress, alcohol or drug use and hypnagogic hallucinations. Some studies have also shown that people with active imagination might be more prone to hypnogogic hallucinations. Recommendations to reduce hypnogogic hallucinations is to get enough sleep and abide to a fixed sleep schedule, and avoid alcohol or illicit medications and drugs. 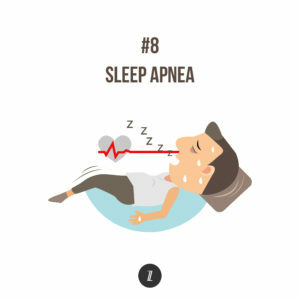 Obstructive sleep apnea is a common sleep disorder whereby one’s breathing repeatedly stops for 10 seconds or more during sleep. The most common causes of sleep apnea is sudden, excess weight gain which causes the soft tissues in the mouth and nose to block the nasal airway while sleeping. Enlarged tonsils or dental conditions such as a severe overbite might also lead obstruct the airway, resulting in sleep apnea. If you’ve experienced any of these rather daunting and strange sleep encounters, do not be alarmed and link it to superstitious beliefs, for all these phenomena can be explained scientifically!